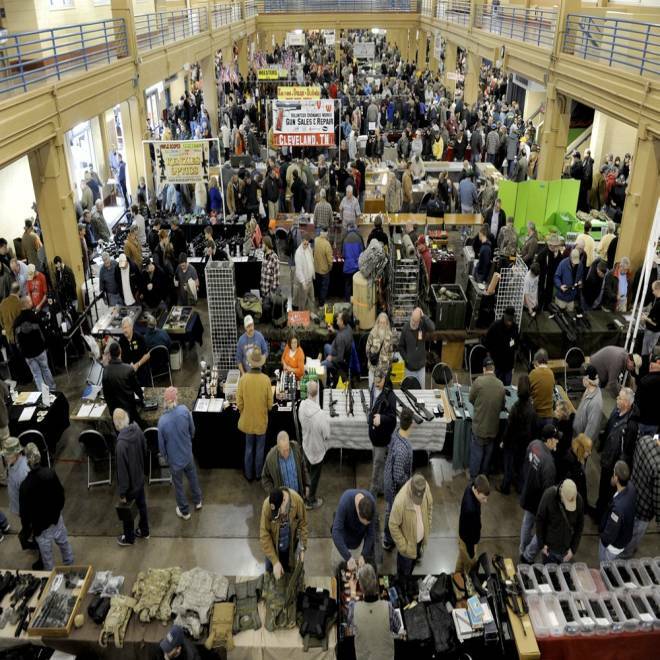 People crowd a gun show in Knoxville, Tenn., on Dec. 28. Attempted illegal gun purchases occur 30,000 to 40,000 times each year among U.S. firearms retailers, according to a first-of-its-kind survey of gun sellers published Monday. Would-be patrons seek to sway sellers to keep transactions off the books or, more commonly, use stand-ins — often girlfriends or wives — to fill out required legal forms and undergo federal criminal background checks necessary to purchase firearms, according to the survey by the Violence Prevention Research Program at the University of California-Davis. Perhaps the most alarming finding in the study — the first to attempt to quantify the frequency of unlawful attempts to buy guns and retailer corruption — is that some firearms dealers are "bad guy magnets," who even though they deny the most attempted “straw-man” and undocumented purchases tend to suffer the most gun thefts and appear to receive the most visits from federal agents tracing guns used in crimes. "The (responsible) retailers consider this a very serious problem that deserves stiff punishment," he added. Cutting down so-called "straw" purchases of guns is among the measures being pushed by gun-control advocates in the wake of the elementary school shooting in Newtown, Conn., on Dec. 14, which left 20 children, six school employees and gunman Adam Lanza and his mother dead. On Thursday, the Senate Judiciary Committee approved a bill that seeks to make it a federal crime to purchase a firearm for someone who is not legally allowed to own a weapon, such as a convicted felon. President Barack Obama has urged the full Senate to approve the measure. Wintemute’s team mailed surveys to 1,600 gun dealers, pawnbrokers and gunsmiths who sell 50 or more firearms each year and received back 591 completed questionnaires. Participating retailers reported that would-be clients tried to make 2,051 straw purchases and 2,254 undocumented buys during the previous year. For that reason, he said, members of the firearm dealers association all receive forms that they fill out during each sale — and ask the buyers to sign — attesting that the weapon is solely for that buyer and will not be re-sold in a secondary market to a felon or any other person who is restricted by state law from owning a gun. The forms have been in use for about 30 years. Many illicit, stand-in gun buyers are women, Wintemute said, citing firearms-trafficking statistics from the U.S. Bureau of Alcohol, Tobacco, Firearms and Explosives. Partly for that reason, he argues that reports indicating that women make up a rising share of the gun market "are a myth."